There were many veterans present for the Memorial Day ceremony at the Legion Post, but this old gentleman in his original uniform really caught my eye. Behind him is a small part of the crowd. 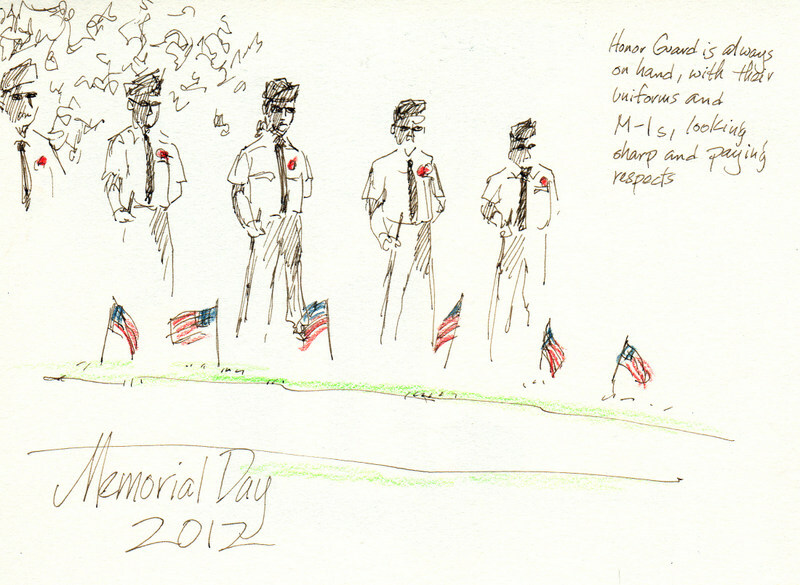 My husband is in the Honor Guard, and I always try to get at least one sketch of the guys as they stand at parade rest. It was a touching ceremony, but my favorite part was afterward, when I got to talk to some of the old vets...the sailor among them who saw four tours of duty on as many destroyers. The men were so willing to share their stories--I wish I had had all day to just sit and listen. Shall we meet in Santo Domingo? 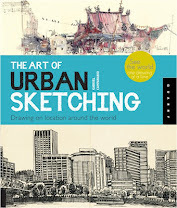 I will be attending the 3rd International Urban Sketching Symposium in Santo Domingo, The Dominican Republic. I attended the first in Portland, Oregon. And the second in Lisbon, Portugal. 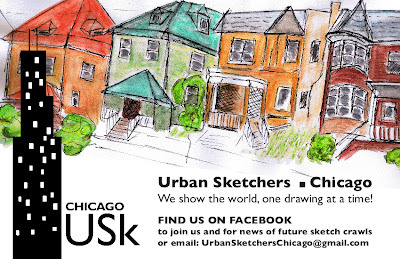 I am hoping other Midwest Urban Sketchers will be attending this July. If you are, it will be great to see you there and sketch alongside you! If you haven't made plans to go yet or on the fence about making the journey, I encourage you: Do it!!!! For me, the Symposium have been life-changing, expanding my creative work to dimensions unimaginable beforehand. Here's a panorama of Lisbon I drew during the workshop conducted by Simo Capecchi (Naples, Italy) and Claudio Patane (Catania, Italy). I'm very excited about their panorama workshop in Santo Domingo. My husband and I spent a total of 3 weeks in Portugal. 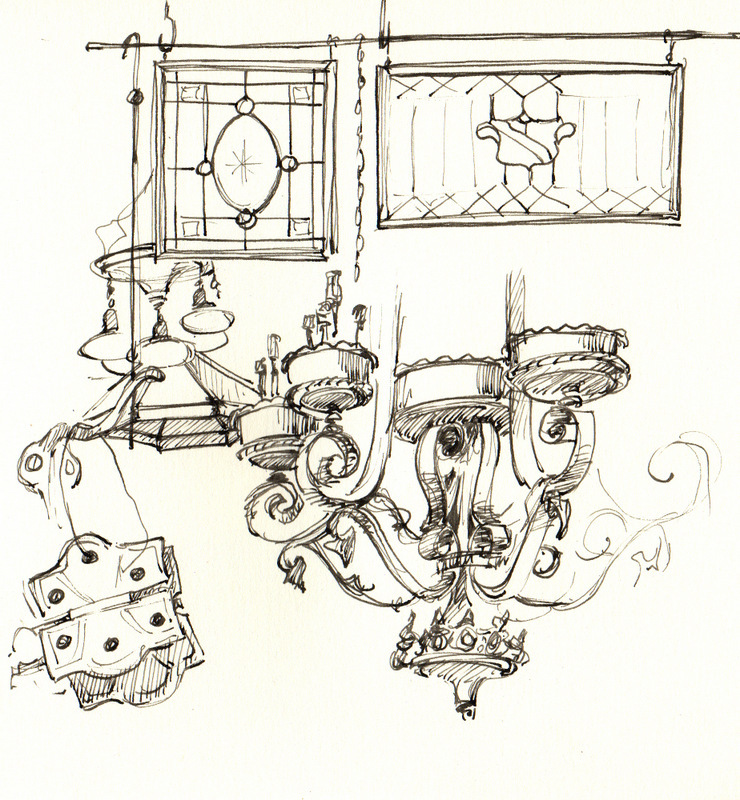 To see more from the Lisbon Symposium and other Portugal sketches go here. For more that I did in Portland and photographs, go here. Mission Concepcion, a photo by vickylw on Flickr. This mission is the oldest un-restored stone church in the country. The original colorful frescoes, though faded and worn away, can still be seen in part. They used some of the same earth pigments that are still used today. The frescoes were painted using the same technique used by Michelangelo in the Sistine Chapel. Established in 1716, then moved to San Antonio in 1731, the church took 20 years to build and was dedicated in 1755. I especially liked the view through the ruined cloisters looking towards the church, the roof of which could just barely be seen through the window. Both of the missions we visited are still active churches today. Amazing history. There's a tiny balcony off my second floor that looks out over the back garden and a neighbor's house beyond. The balcony is barely big enough to set up my traveling easel. I wanted to capture our out-of-control climbing roses before their first bloom of the season faded. I spent 3 hours on Wednesday, standing in a hot sun, and then another 1/2 hour Thursday to get it done enough. My preference is to do a drawing in one block of time. But I was wilting and my crayons were melting. I too went sketching with USk Chicago on Sunday, during NATO visit to Chicago. 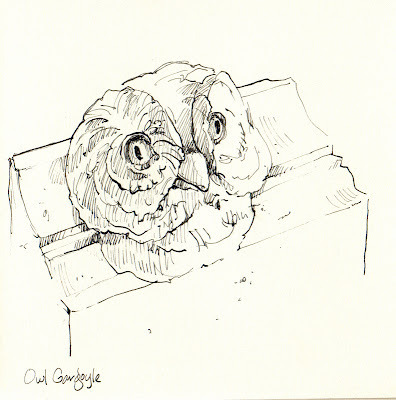 I was sitting right next to Barbara, so it is no wonder we had same subjects to sketch. 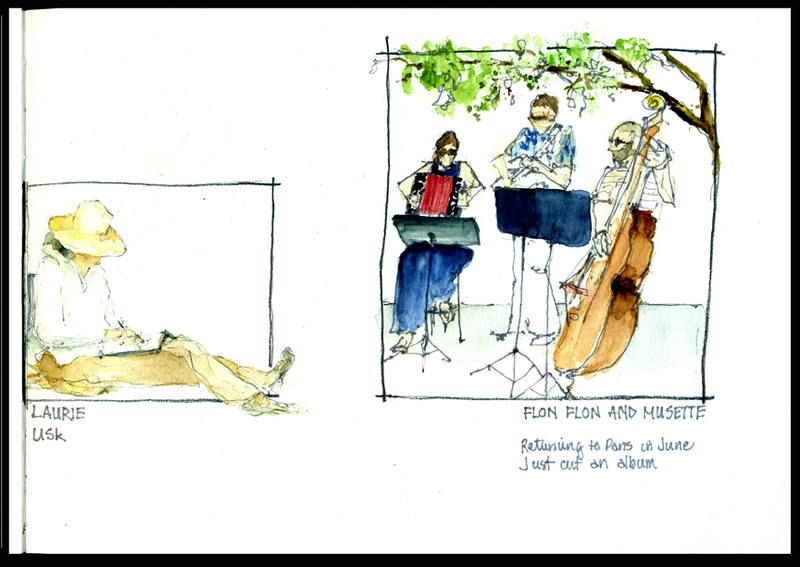 Here's my version of Flon Flon & Musette quartet, as well as Sketching the Sketcher fun. 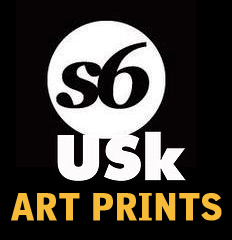 This is Laurie, a USk Chicago member. She brought a pillow to sit on, how ingenious is that! I am often hesitant about sketching people, because I am fairly slow and people tend to move too fast. Sketching a Sketcher you can be reasonably sure she's not going to move, at least not for a little while. At least one Chicago sketcher has found USk Chicago by reading this very blog. Should more Chicagoans land here, I want to mention that USk Chicago will be meeting in Chinatown on Sunday, June 17 at 12noon. Find us by the red gate/bridge at the entrance of Wentworth St, a few steps south of Cermak Rd. I've been consumed by gardening the past two weeks, since I returned form my trip to San Luis Obispo, California. 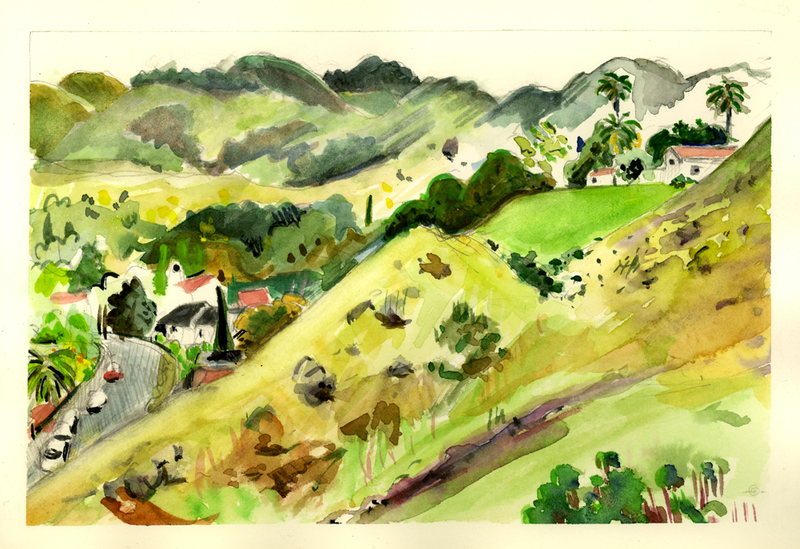 Finally, last week, I was able to get some drawing done on my hometown turf. Here's one from downtown Waterloo (the twin city to Cedar Falls). 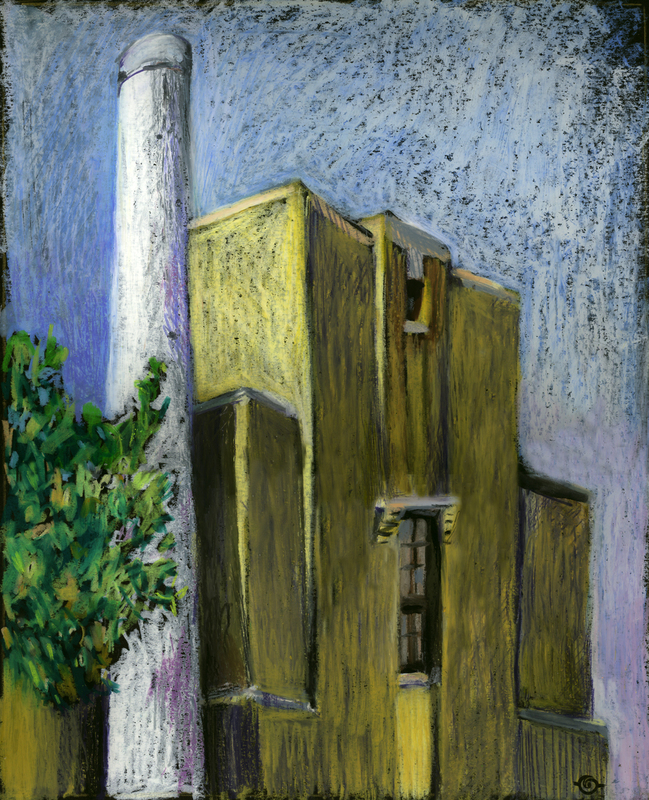 All winter long, every time I'd be over in Waterloo, I knew that when the weather turned warm enough to draw outside, this pump station, the Waterloo Waterworks building, with its chalky white smokestack, would be at the top of my must-draw list. I've included more of the little that I could cull about this building on my flickr post. The peonies are blooming! A neighbor has a wonderful bed planted on the boulevard between the sidewalk and the street. One can't procrastinate when it comes to drawing flowers. These are now droopy and faded, only a few days later. Do other communities have flower beds like this? Technically, it's City property, but each property owner is responsible for mowing and/or tending it. views from our hotel room, a photo by vickylw on Flickr. Now that we are home from our trip, I'm slowly finishing up the sketches done in San Antonio, Austin, and Houston, Texas. 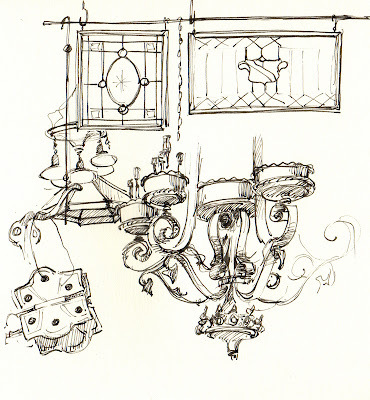 This sketch above shows some of what we could see from our room's terrace. I debated a few days over whether to add full color or not --- the San Fernando Cathedral was so lovely to look at, I decided to leave the rest in ink only. At night this cathedral is beautifully lit up. We explored two missions in the area (besides the Alamo). This first one was nearly fully restored in the 1930's, making it easy to envision life there in the 18th century. The Spanish converted virtually all the hunter-gatherer tribes of Native Americans in the Texas area to Christianity --- these missions were their communities, fields, herds, and protection from the warring tribes. But they used to drive the priests "nuts" because they slept on these hard stone floors instead of on the beds provided! 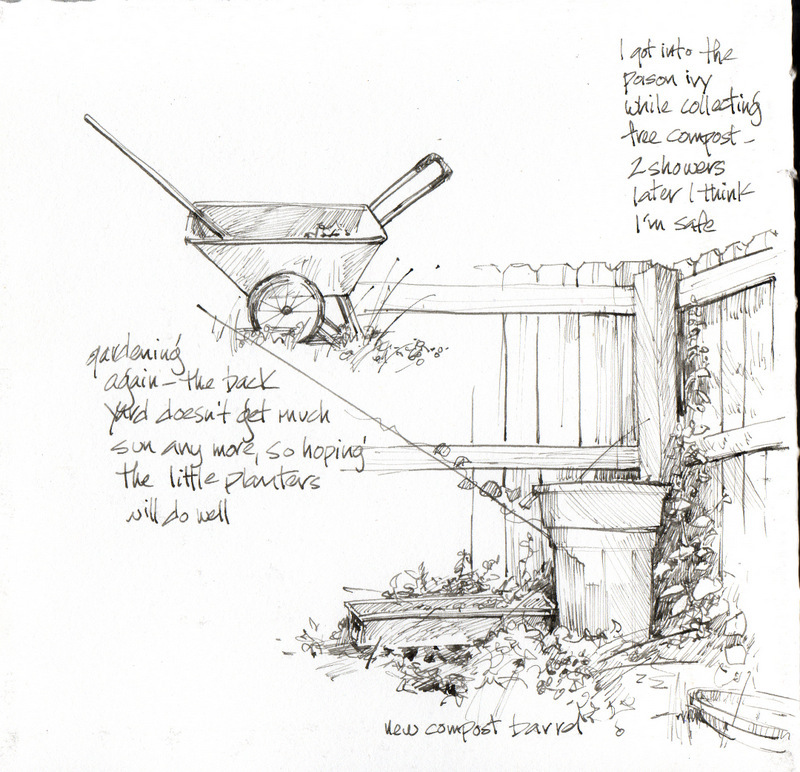 I am loading all sketches on my Flickr site (as I finish them) but only some on Blogger; if interested, you can see other sketches HERE. There will be more posted in the next few days. Believe it or not these sketches were done in Chicago over the weekend. The top one was done at the Annual Kids Kite Festival at Montrose Harbor. It's always a great time. Amateurs and professionals alike (Professional kite flyer? Why didn't I hear about that job growing up?) spend the day battling the wind, string tangles and trees for that glorious moment when you catch the wind and soar! The second one was done on Sunday at Lincoln Square. 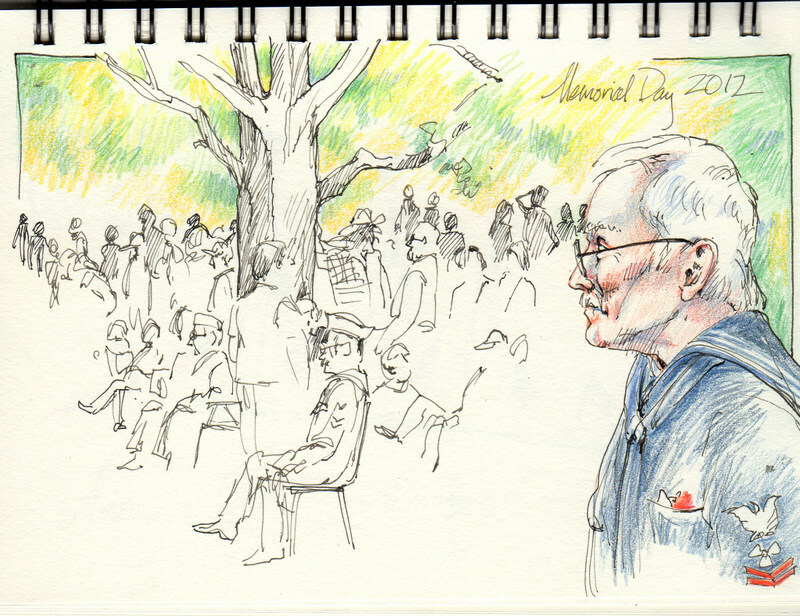 I met up with Urban Sketchers Chicago and enjoyed a delightful couple of hours. The band, Flon Flon and Musette, were a group of musicians from France. They've just recorded their first album. It seems I was just getting into the drawing when their set was up! One band member is missing along with assorted limbs and instruments. Ah the thrilling sport of urban sketching! McNay Art Museum, a photo by vickylw on Flickr. When we arrived in San Antonio, rain was pouring down -- so we first went to the McNay Art Museum. I had been here once before, researching for a local museum project -- Marion Koogler McNay grew up 3 blocks from where we live in Kansas, her family's wealth coming from the El Dorado oil boom. Sadly, I found that much of the original interiors of the 1920 home have now been covered up to enable them to display more art. The house itself was as much a piece of art as the collection. The 24-room Spanish Colonial Revival house and it's interior open-air patio are filled with beautiful handmade tiles, stenciled ceiling beams, and rich woodwork. Now only the entry way is left as it was, with twin tiled stairs curving up to the second floor. McNay collected 19th and 20th C. art, as well as Southwest art. When she died, she left her home and collection to the city of San Antonio as a modern art museum. My favorite El Greco had been moved upstairs; the Van Gogh and a favorite Georgia O'Keefe were off exhibit. But there was still plenty of great art to view, along with some I don't particularly like. Hello all! 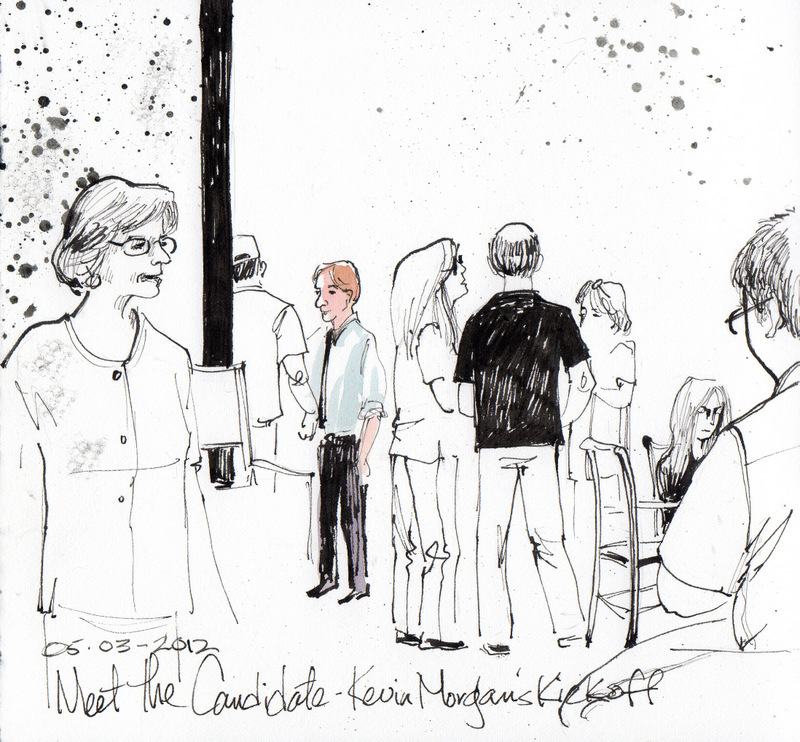 Kate invited me to participate in USk Midwest, and I accepted with delight. Thanks, Kate! A little intro, perhaps. 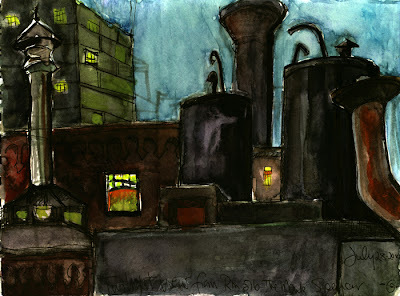 I am an urban sketcher and a painter. I live in Chicago, and you will likely see more Chicago sketches from me. 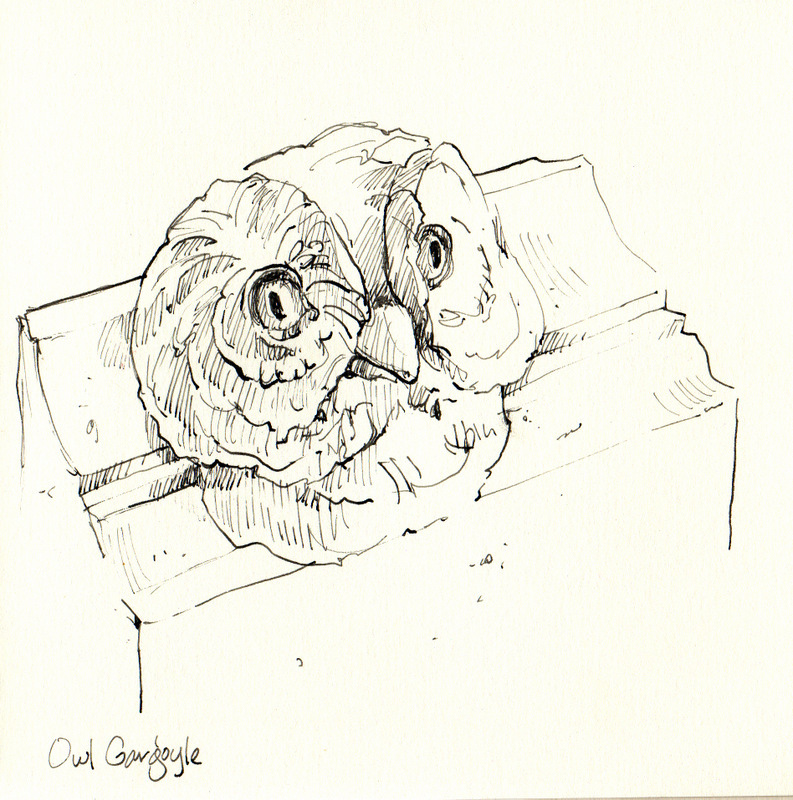 I have a blog - Pencil Scribbles - with more pictures and stuff if anyone is curious. I tried out my new Hero calligraphy pen at my friend Kevin Morgan's campaign kickoff for State Representative...I am SO not a political party person (not to mention crowds! ), so I found a corner to sit and sketch. FUN. 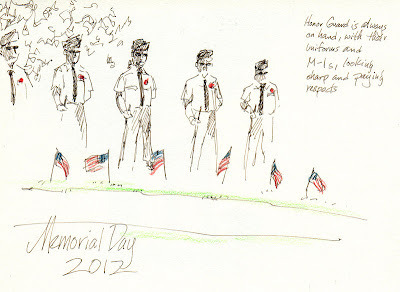 Yesterday our Monday Sketch Group met at the Palmer House Hilton in Chicago. Many thanks to Ken Price in public relations who made sure we were cleared to sketch to our hearts content in the very busy lobby. The Palmer House was built in 1871 by Potter Palmer as a wedding gift for his wife Bertha. It burned down during the Great Chicago fire, only two weeks after it was complete. Rebuilt right away, then renovated in the 1920's and again just recently, the hotel has always maintained it's aura of grandeur and glamour. Although I've been to the Palmer House on many occasions I found I was overwhelmed by the idea of sketching there and had trouble focusing and simplifying. It was still a fun experience. I had planned to add some of the rug pattern somewhere on the page but didn't get to it. Oh well, I'll just have to go back! My recent trip to California was to the Central Coast, staying in San Luis Obispo. It's a place I return to; it has a bit of Brigadoon magic for me. I travel with probably way too many different medium. (I never have mastered the travel-light mode.) But sometimes circumstance and time calls for one medium and then sometimes another. So here are 3 different ways of representing my week long time there. 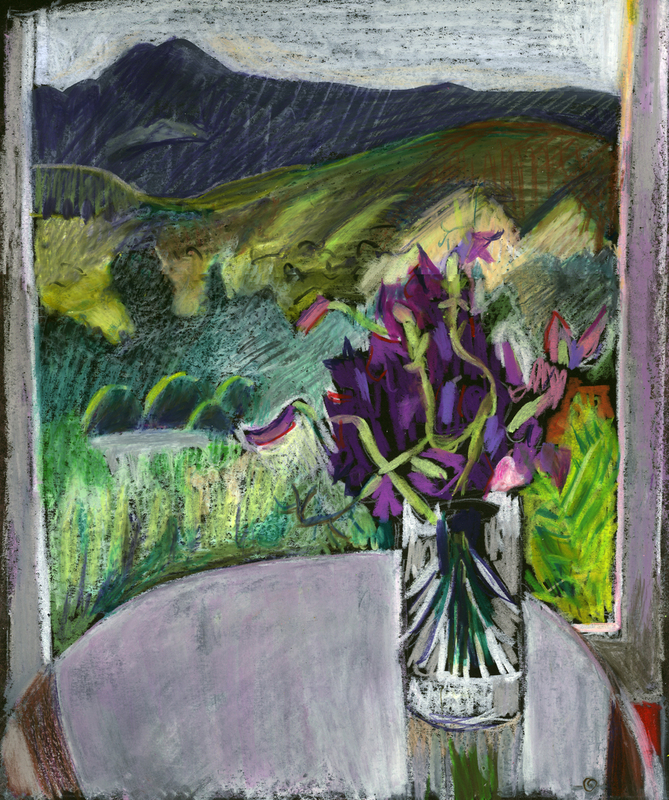 "South Hill View and Sweet Pea Bouquet". NEOCOLOR II WAX PASTELS on black paper. From the house where we stayed, looking across the foothills to the Santa Lucia Mountains. The bouquet was purchased from a white haired woman at the farmers market, whose clothes matched the colors of her flowers. For more Inside/Outside drawings go here. "South Hill Neighborhood". Another from the house in San Luis Obispo, this time in WATERCOLOR. Looking across the adjoining open space preserve into the neighborhood below and the foothills beyond, it's 45 degrees to the right of the Neocolor above. 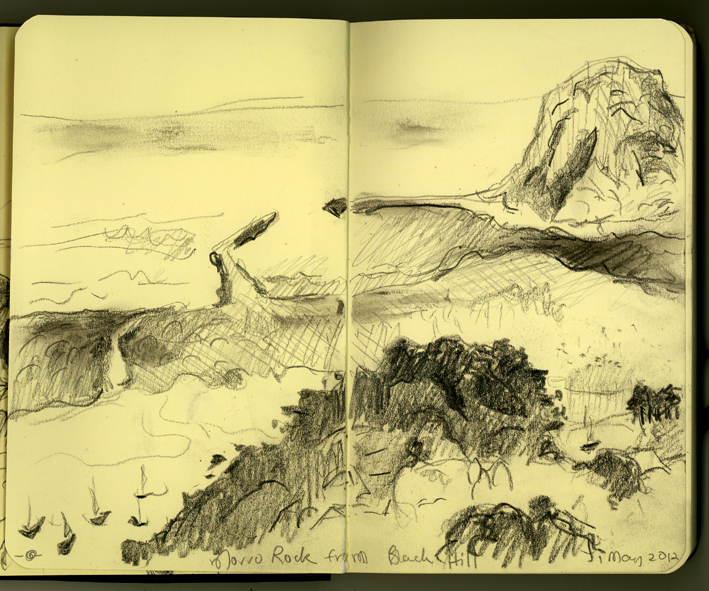 "Morro Rock from Black Hill". 15 miles to the coast from San Luis Obispo is Morro Bay. Hiking to the top of Black Hill on a glorious clear day, I was rewarded with the view of the last visible, of a string, extinct volcano that defines this region and the Pacific Ocean. 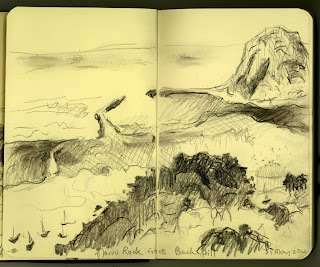 My pocket-size moleskine and a stick of WATER SOLUBLE 9B GRAPHITE STICK was all I carried. 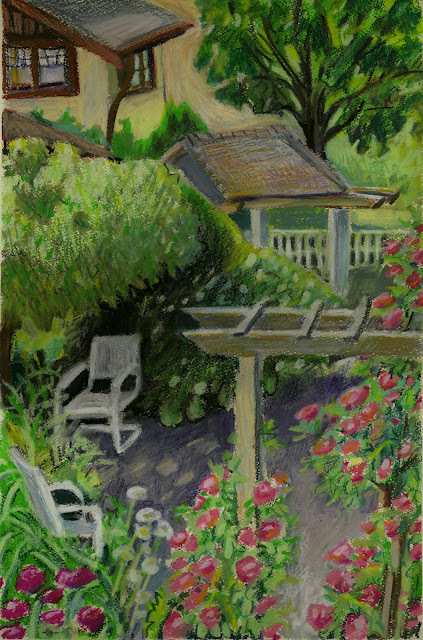 Maybe on another trip, I'll lug my easel and Neocolor II or watercolors up there. For now, small, fast sketches are a great part of my process. If you'd like to see more from this trip they're on my flickr photostream. Comments or critique are always appreciated! 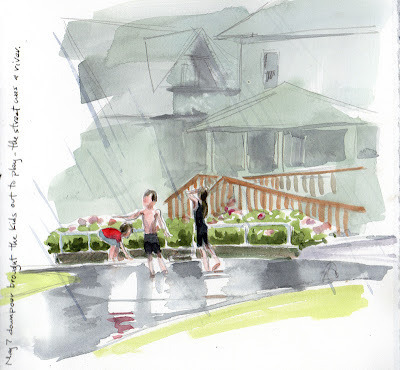 You're liable to see this anywhere--kids playing in a downpour! The street was a river, and they were having a ball. In bigger cities, in the summer, kids pay in water from the fire hydrants...when ours sprung a leak a few years ago, it happened right in our neighborhood. I love this place! Stained glass, lamps, windows, coffee pots, Buddhas, doors, latches, porch pillars, and more, all of it rich with history. You can see my other sketch, of one of Kansas City's many fountains on our parent blog, Urban Sketchers. Ted Drewes Frozen Custard is on the 6700 Block of Chippewa. People stand outside and eat their frozen custard from one of several locations of Ted Drewes Famous Frozen Custard treat. I Like to order a "Fox Treat", "Cardinal Sin" or "Terramizzou" sundae from the many flavors. Today I tried the "Dutch Treat" sundae instead of the usual. It has caramel and pecans. Delicious! Sunday's sketches, a photo by vickylw on Flickr. Just a simple sketch done when we arrived at church, before others arrived --- this old truck was parked in a lot next door. I like how it had been customized to fit the owner's needs, with the bars holding wood on the side and the cut-out holes in back allowing the original tail lights to shine through. On Sunday I met up with Alex Zonis, who has started a Chicago branch of Urban Sketchers, and several other sketchers from the area, for the first USk- Chicago meet. We met at the Art Institute (BTW the Streetwise vendor from my April 17th post is Ed). It was quite cold so we went to a near by Cosi's for coffee, sketching and talk. It was a good time. 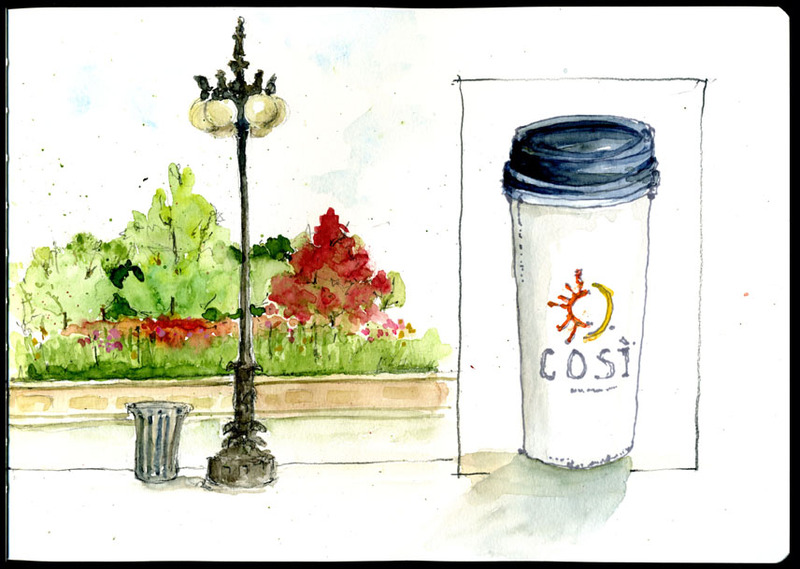 This is a sketch from Cosi's window looking east across Michigan Avenue and, of course, my coffee cup. 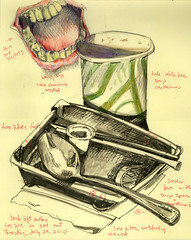 One thing I've learned reviewing old sketchbooks and posts is I drink a lot of coffee! Another thing I've learned is that members of the sketching community are remarkably generous with their time and talents and eager to help. 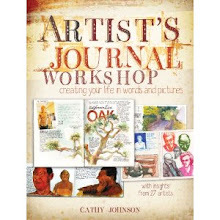 I'm really thrilled that my circle of fellow sketchers is growing both online and in person!